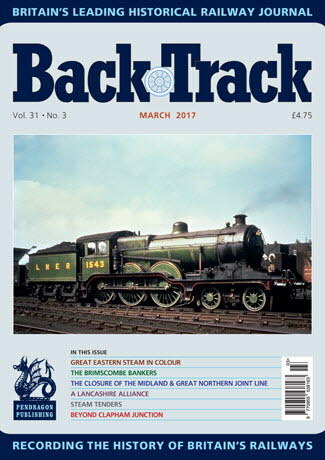 Railway Magazine | BackTrack March 2017 journal from Pendragon Publishing. Changing at York - Tom Heavyside's three pages of colour shots of the York scene in the late 1970s and early 80s. What about the Workers? - Archive photos of a variety of railwaymen at work in a range of activities. The Closure of the Midland & Great Northern Joint Line: Part One - One of the major railway closures of the pre-Beeching era examined by Edward Gibbins. The Brimscombe Bankers - Mike Fenton looks at the working of a steeply-graded GWR main line in the Cotswolds. Getting a Quart out of a Pint Pot: Part One: Boosters and Steam Tenders - Miles Macnair looks at various ideas to obtain extra performance from locomotives. Representing the Eastern Counties - four colour pages of Great Eastern Railway locomotives. Ripon - A City no longer with a Railway: Part Two - James Rogers concludes his history of the city's station. A Lancashire Alliance 1863-1870 - Jeffrey Wells tells how the Lancashire Union Railway came into being. Morfa Mawddach in limbo - Max Birchenough's colour photos of a once significant Cambrian Coast junction station in 1968. The Great Silence and the railways, 1919 - Jeffrey Wells notes how the first anniversary of the First World War armistice was marked. Beyond Clapham Junction - Michael H.C. Baker reflects on railway travels in south London suburbia. Carruthers (and others) - the story of a staff fraud perpetrated on the Liverpool Overhead Railway in 1902 told by John C. Hughes.